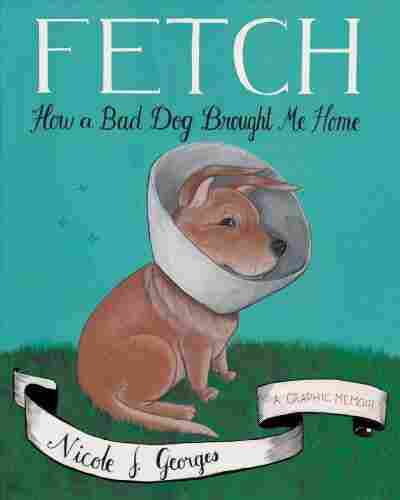 Book Review: 'Fetch,' By Nicole J. Georges Do you deserve your pets? Do you deserve the people in your life? In her new graphic memoir, Nicole Georges suggests the two questions are closely related — and you may not like the answers. Do you deserve your pets? Do you deserve your people? Nicole Georges suggests in her new graphic novel that the two questions are intimately related, and she leaves little doubt it's the first one that really matters. If you're a true pet person, you've known the agony of encountering someone who – whether ignorant, emotionally unavailable or just plain flaky – should not be in charge of animals: The dog walker who leaves his companion to wait in the cold while he plays scratchoffs in a liquor store; the kitten adopter who talks blithely of declawing. Such people, one can't help but believe, are just as careless with the humans in their lives. But that's not really what stirs ire – for the pet person, anyway. As in life, so in Fetch, Georges' devotional, 314-page memorial to her dog Beija. Georges describes many problematic people in her book – beginning with her neglectful mother, continuing through a parade of roommates and lovers, and ending with herself – but it's hard to take their sins against each other all that seriously. Far more important than their human-to-human missteps are their attitudes toward Beija – the name, Georges tells us, means "stranger" in Polish – who comes across here as a kind of canine truth detector. Neurotic, mercurial and violent, Beija nonetheless has an uncanny ability to divine people's true natures. Beija bristles and snaps at most strangers, and yet certain individuals manage to win her doggy approval. These paragons, grudgingly given leave to pet her, wind up occupying important places in Georges' life. Conversely, it's not too surprising when people who can't get along with Beija don't work out on the human level. "Beija and I had some things in common. If you followed [our] rules, then we were fine. Otherwise, we seemed very unwieldy," Georges writes. "This boy I dated bugged us both equally. In truth, he thought it was funny to push our buttons ... Needless to say, this relationship did not last." Even the relationships that do last in this book are nothing compared to Georges' bond with Beija. The art reinforces this message: Beija is beautifully drawn throughout, with buttery arcs defining her stocky little body and wonderful, forward-pointing ears. She's charming even when she barks all day (a habit that had its inevitable effect on many a landlord) and snaps at children, and luminous in realistic full-page portraits here and there throughout the book. Georges' people, on the other hand, are toylike and inelegant, their features cramped on billiard-ball heads, their bodies awkward afterthoughts. [Georges] reminds us that we must always strive to live up to our pets: Even the neurotic, troublesome ones are always going to be more than we really deserve. It's tough to sympathize with such ignominious creatures, which is just how Georges wants it. She portrays herself as a loner at heart, who's nonetheless surrounded herself with strangers for much of her life. Her depictions of one Portland, Ore. house — an anarchic "punk space" where even the closets were rented out and sofa crashers were the norm — are distressing, not least because the other residents started calling her "Mommy" and expecting her to plunge the clogged toilet. Their entitlement mirrors that of her own mother, who was in the habit of leaving Georges with siblings or sitters while she went off with one or another dubious boyfriend. The most memorable caretaker, an astrologer named Irene, inspired Georges' love of self-publishing with the "hand-typed newsletters with columns and advice, horoscopes and comics" she created for "her geriatric and witch friends." "A fire came alive in me," Georges recalls. "A sense of purpose and desire. The existence of this outsider art made me realize it was possible." Of course Georges is a zinester at heart; the pages of Fetch have that chaotic, overcrowded sense of composition that's a hallmark of many self-published comics. It gets a bit wearisome after a couple hundred pages go by — the style may nicely capture Georges' theme of human fallibility, but it's hard on the eye. On some cluttered pages, the only visual relief is provided by Beija, a clean white shape with those delightful cocked ears, which is apparently a good parallel for how Georges experienced life with her beloved dog. She reminds us that we must always strive to live up to our pets: Even the neurotic, troublesome ones are always going to be more than we really deserve.